A poll by Axios and SurveyMonkey found 61 percent of Democrats believe Republicans are racist, sexist and bigoted, and 31 percent of Republicans think the same thing about Democrats. 54 percent of Democrats find Republicans to be ignorant, 49 percent of Republicans believe the same about Democrats. 44 percent of Democrats find Republicans spiteful, 54 percent of Republicans feel that way about Democrats. 21 percent of Democrats and 23 percent of Republicans find each other to be evil, respectively. Have we lost the civil society? Only tiny percentages found the other party to be fair, kind or thoughtful, ranging from 2 to 4 percent. I personally would have been an exceptional person polled if they had called and asked about Democrats in my life who I found to be thoughtful, honest and caring. Then again, my entire immediate family are Democrats, who I speak to every day. Often politics come up but nobody hates each other at the end of the day. Family first, not party first. It’s something I’m reminded of with Thanksgiving right around he corner when I’ll be traveling up to New York with my family. In a similar vein, many people are lifelong friends. We chose to be friends before we ever chose our politics. Should reconsider those bonds later in life when politics come up? How do we reconcile what politicians do in Washington, D.C. with how friends and family vote at home anyway? Are those really the same thing? Especially when we consider that the one of the biggest predicters of political affiliation, at least at a younger age, remains how your parents voted. There are exceptions, of course; you’re reading one of them right now. A country is a lot like a family in that respect. The premise of elections and a republic is that elections and legislative processes deal with those disagreements that do arise. If we cannot be civil and let the Constitution work the way it was intended, including elections, then we don’t have much of a country. It turns out that millions of Americans across party lines definitely agree with Clinton if the Axios/SurveyMonkey poll is to be believed. The numbers point to a potential powder keg. Both sides hate each other. It seems that a lot of folks — not all, and not even a majority per se, but a lot — are identifying a lot less as Americans nowadays and more along partisan lines. This did not happen overnight. It is also not the first time the parties have had different values they believe are important. The system calls for it. Elections are supposed to result in representation of those values. I doubt the problem is that the parties have differences, which should be a given. Where we might have a problem one day is if too many people believe that democracy is not the answer to reconciling national differences and that war or violence or dictatorship would somehow be preferable to impose their own values. 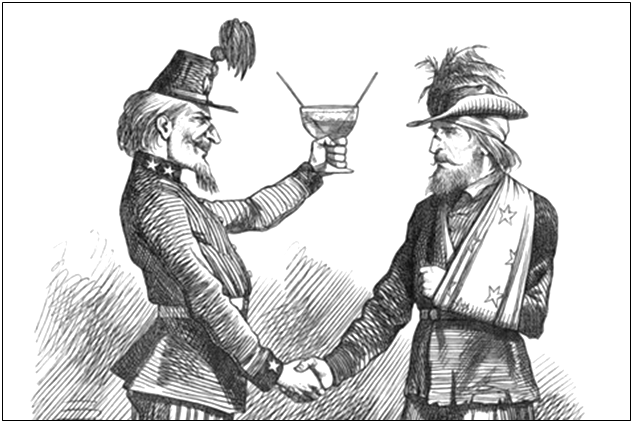 The Civil War was not only party versus party, region versus region and slave states versus free states, in many cases it was brother versus brother. It was the most horrible thing that ever happened to this country, as 620,000 Americans died. We’re still reeling from it in many ways. It was based on irreconcilable differences. Yes, slavery, a moral abomination, was abolished. But that war and preserving the Union came at great cost. I’m not certain the Union would survive another Civil War. So I see polls like that offered by Axios and SurveyMonkey and I worry a lot about that. To overcome the possibility of civil strife we will have to rise above partisan madness. Go back and read the poll’s question. Are your political opponents really evil? Or do you simply happen to disagree on a range of issues that can otherwise be resolved via elections? There’s a lot more that brings us together as a country than tears us apart but that faith is sometimes tested. Perhaps we’re going through one of those trials right now. I like to think that, as we enter the holiday season and sit down for Thanksgiving, that we still see each other as fellow Americans.